My favorite gameweek is here! I call it my favorite only because 7 is my lucky number, and probably also because Gameweek 6 is finally behind us. Last gameweek was personally my worst ever. Not just did my fantasy team take a beating, being a Gooner made it worse for me. Anyway, now we have reason to believe something positive will happen in this week because honestly, the ball cannot drop any lower. 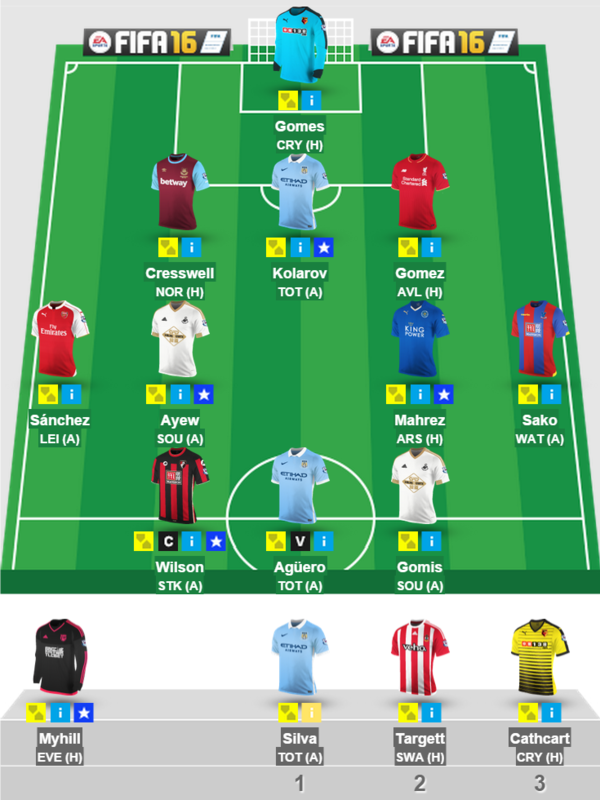 So here it is, our team for Gameweek 7. Not many changes since the last weekend, so the logic of selecting those players more or less remains the same. Oh yeah, we’ve made a couple of transfers, so watch out for some info around that space! Holding the line for FFT this week would be Gomez (4.8), Kolarov (6.1) and Cresswell (5.6) who get transferred for Francis. All three players face decent opponents this weekend in Norwich, Vila and Spurs in that order. One may have second thoughts on playing Kolarov but we can’t do much given the choice of substitutes at our disposal, which are Targett (4.0) and Catcarth (4.5). One may choose the path of wishful thinking since Kolarov by far has been the highest scoring defender in league. Fingers crossed! FFT’s midfield last week performed decently, thanks to the Mahrez (6.0) show that continues to go on, which is why he retains his place this week as well. Sanchez (11.0) and Ayew (7.3) both retain their places in the playing eleven owing to decent fixtures in Leicester City and Southampton. Sako (5.6) is our fourth midfielder who makes it to the team owing to an injury sustained by our choicest midfielder. Sitting on the side lines this weekend would be David Silva (10.2) who has not been fit for 2 gameweeks in a row and even if he manages to get some play time this weekend, it remains to be seen how much time the Spaniard would consume to get into his silky self. However, this should not be a cause to panic and offload him so soon. We have to thank our forwards for being the saving grace for FFT in the last few weeks. Since Benteke is pretty much ruled out for the weekend, we transfer him out and get in his place Bafitimbi Gomis (7.4). Although he seems to have calmed down a bit after the initial goal scoring blitz early in the season, (he should really think of another celebration now), it seems like a fair buy given the price and scoring potential the player has. Also, Aguero (13.1) and Wilson (5.7) have been on top of their game. Aguero has been a tad bit unlucky but the law of averages suggests that a bit haul is in the reckoning for the Argentinean powerhouse. And Wilson, surprises me every gameweek! Definitely going to be a big target in the next transfer window. Right guys, here it is- FFT’s fantasy team for gameweek 7, after 2 transfers. Enjoy your weekend lads!